In the new Cameron and Crown line, Scotty Cameron addresses golfers that need to have a shorter length putter. The line offers a range of heads to fit different desires in looks and stroke. To be clear, these putters are not simply a 35-inch putter that is cut to length. They are specifically designed to be 33 inches. 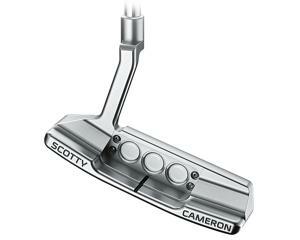 The head and sole weights beautifully balance this newest addition to the Cameron putter family. 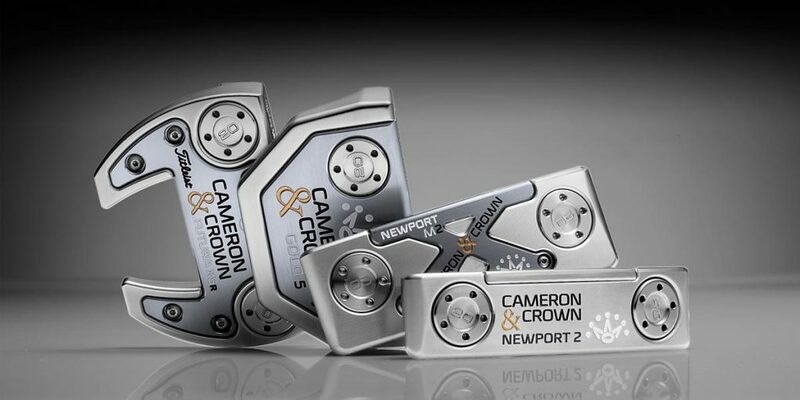 The Cameron and Crown putters are available in the Select Newport 2, the Select Newport M2 Mallet, the GoLo 5, and the Futura X5R. The Cameron and Crown Select Newport 2 features a heel and toe weighted head and plumber’s neck. The head and face inlay are made of 303 stainless steel, which creates a very responsive feel. 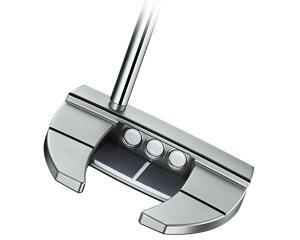 The Cameron and Crown Select Newport M2 mid-mallet features a 303 stainless steel body, 6061 aircraft-grade aluminum face-sole technology, and flowing single-bend shaft. Notable with this model is the pop-through sight line. It is crossed, making alignment easier. 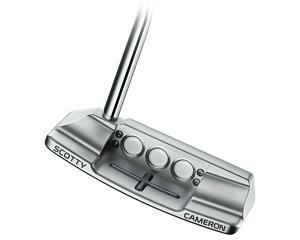 The Cameron and Crown GoLo 5 boasts a body made from 303 stainless steel with 6061 aircraft-grade aluminum sole plate. Combining the two metals subsequently gives responsiveness and a soft feel at impact. 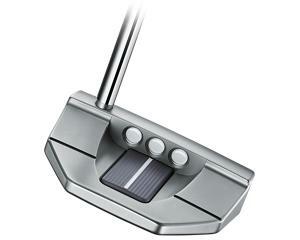 The pop-through and perpendicular sight lines make aligning this putter a breeze. The body of Cameron and Crown Futura X5R is made of 303 stainless steel. This wingback design leads to a higher MOI and therefore forgiveness. Cameron places an aluminum flange on the sole. The flange adds weight distribution and forgiveness to the putter. The final notable feature in this line of new Titleist putters is the white Matador grip. 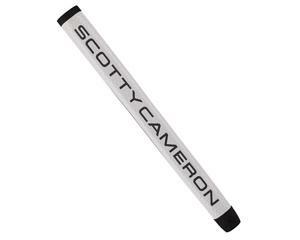 This grip is smaller in diameter when compared to the Matador grips that are used on other Scotty Cameron putters. The smaller grip is better, traditionally, on a shorter putter matching the feel, weight, and performance. If you’re in need of a Titleist putter that is 33 inches, look no further than the Cameron and Crown line. The care and craftsmanship shine as bright as the jewels on a crown. 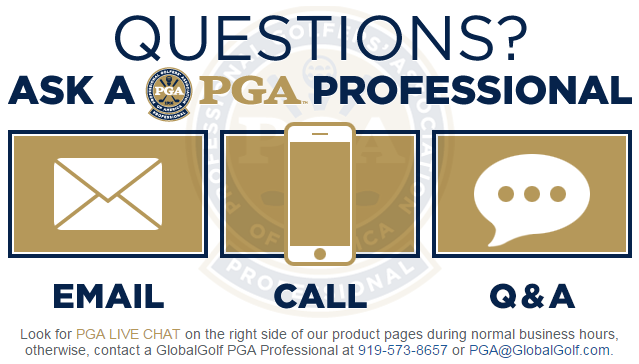 Alan Unruh is a Class “A” member of the PGA of America, and holds PGA Certifications in General Management, Golf Operations and Player Development. With these certifications, he is among the 1% of PGA members that hold multiple PGA Certifications. He has a profound passion for the game of golf along with extensive experience and knowledge regarding planning and strategy for golf operations, rules of golf, tournament operations and golf swing fundamentals. Alan has also played a crucial role helping manage multiple high profile tournaments throughout his career including the USGA Women’s U.S. Open, PGA and LPGA Tour events, and multiple NCAA and AJGA events.